Guns of Glory is a free MMO RTS game, developed by FunPlus, which also released King of Avalon. This post will give a specific guide about how to play Guns of Glory on MEmu App Player. 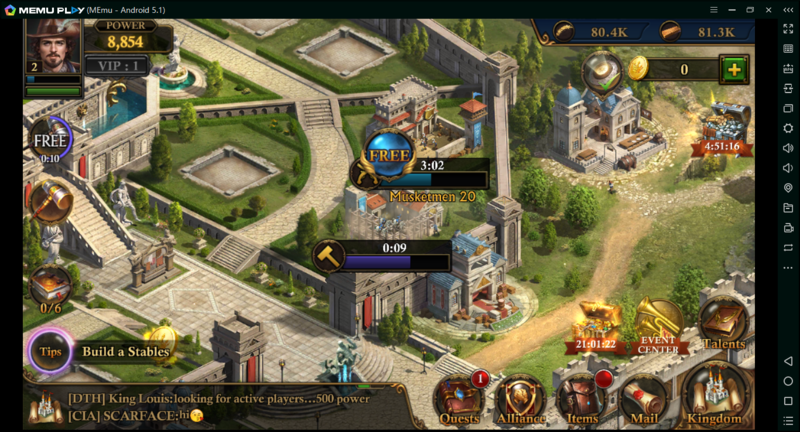 you need to take the lead as a rising Lord in a Kingdom thrown into war! To become supreme ruler and seize the Crown of Destiny from the devious Cardinal, you’ll ally with the famous Three Musketeers, slay ferocious beasts, build your own magnificent Castle, engineer an unstoppable Airship, rally with friends to destroy enemies, and more! As a Heavy game, Guns of Glory requires plenty of time and need to stay on the screen all the time, it is not realistic to keep you phone open the game all the time, so we recommended Play Guns of Glory with MEmu App Player. Strategy Warfare: Train an army of loyal Musketeers. Manage your resources, construct devious traps and raid your enemies into oblivion. All in order to claim the crown and turn your Alliance into an unbeatable empire! Powerful Airships: In an era of emerging progress and science, shoot down enemies and lead the attack with deadly advanced aircraft for a new level of RTS warfare. How will you customize your own flying warship? World War: Seamless chat translation features make GoG’s multiplayer RTS and RPG gameplay richer than ever before – making friends from anywhere in the world has never been so simple. Immersive MMO World: Guns of Glory brings the world of the Three Musketeers to life like you’ve never seen it before! Gorgeously rendered HD graphics and vivid, beautiful landscapes make all the action in this free strategy MMORPG spring to life! Advanced RTS Combat: Set your own strategy to attack enemies and aid allies! Guns of Glory’s strategy MMORPG gameplay lets you customize your Airship, Estate, troops, buildings, equipment and more. Develop a game strategy to fit your own style in GoG and claim victory! Empire Building: Construct a glorious fortified Estate, master a range of devastating skills and arm yourself with indestructible weapons to ensure your survival and success in this world of multiplayer strategy war! I recommend playing Guns of Glory on PC using MEmu Player. If you haven’t downloaded already, please install it here. In MEmu Player, install the APK you downloaded using APK icon along the right side. Once installed, you will see it on your home screen list of apps. Simply open it and the first launch will begin to download game resources. Once complete, you will able to play Guns of Glory on your computer!